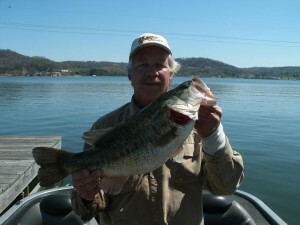 Springtime Bass Fishing in March, April and May for Big Bass on Alabama’s Lay Lake! Written By Reed Montgomery / Reeds Guide Service Birmingham, Al. Internet Website www.fishingalabama.com also see us on Face book! Intro; March begins and Alabama’s largemouth bass and Coosa River breed of spotted bass suddenly make their move towards Lay lake’s shallow, spawning grounds. Preparing their beds, to reproduce yet another year’s offspring of thousands of newborn baby bass fry, as the spawning season of Spring gets underway. As the second week of March progresses this age-old, fifty mile long, man made lake (now over 100 years since its impoundment in 1914), will be showing rising water temperatures (as air temperatures rise as well), coupled with steady, nighttime air temps (from the low-to-mid 60’s), to the preferred spawning water temperature of 72 degrees. 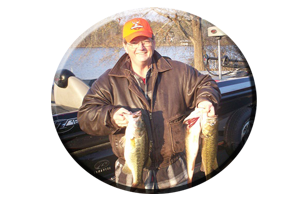 As nighttime air temperatures continue to rise into the mid-to-upper 60’s (coupled with normal, predicted daytime air temperatures of mid-to-upper 70’s), all throughout the second week of March, Lay lake’s bass will begin to move towards the lake’s shallows. All that awaits them is a full moon and a few weeks of steady, warming waters. Including continuing rainy fronts, as the stage is set for these bass to suddenly make their beds and begin the actual Spring spawn. Spotted bass can be seen cruising in pairs and both male and female spotted bass will begin to gather together, preparing visible beds actually seen along the lake’s rocky shorelines, along flats and even up in small cuts and pockets. These spotted bass beds can be a little deeper and they can be discovered along rocky banks, boulder-strewn banks, deep rocky bluffs and along man made rip-rap rocks found around bridges, culverts, causeways and the dam area, located on the lake’s lower end. Incoming rocky points, red clay or hard bottom points situated along the mouths of major feeder creeks and secondary points found up in major feeder creeks, including drop-offs situated along main lake flats and small cuts and pockets, are just some of the first places bass anglers should target for discovering some huge schools of big, pre spawn bass. 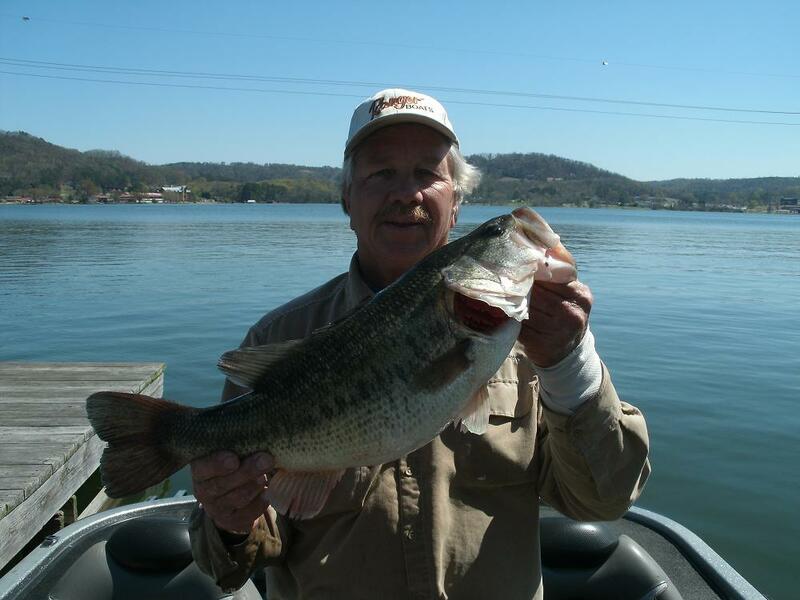 Spawning bass will be evident lake wide during the entire month of April. Aquatic weeds will be in full bloom. The lake will be full pool. 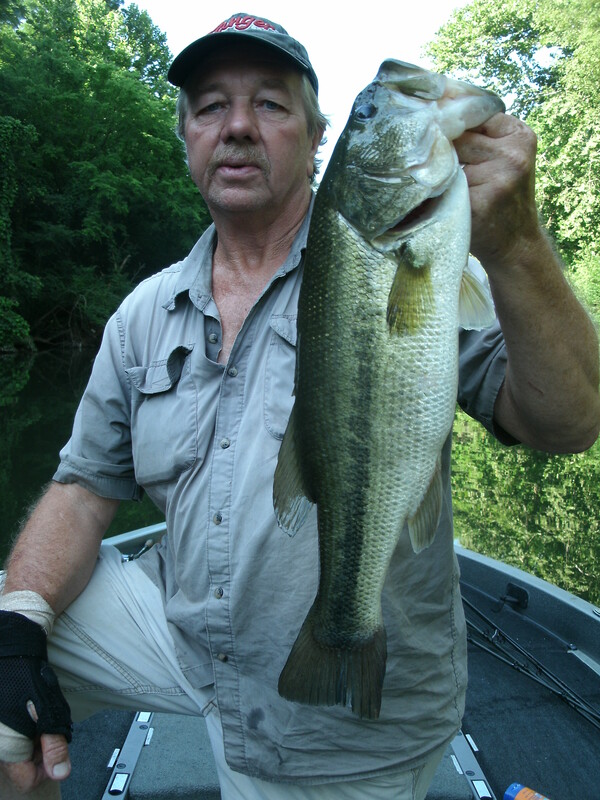 Water temperatures of 72 degrees are the perfect spawning temperature for most of Lay lake’s bass. And another full moon in late April. Although some bass may be late spawners due to cooler water temperatures discovered in certain portions of the lake’s deeper waters, like spawning sites located on the lower lake. These are places with deeper water and much clearer water (places that are always slower to heat up) and usually the last place anglers will find actual late bedding bass on Lay lake during the month of May. Actually, the mid portion of Lay lake features loads of suitable spawning grounds. Places like major feeder creeks to smaller feeder creeks, miles of main lake flats, many mid-lake islands, dozens of smaller, weedy cuts and pockets (most of which feature clear to lightly stained water conditions, or even muddy water conditions from incoming rains). These will be the first places to really heat up the “fastest” as bass anglers monitoring their water temperature will see. The lake’s earliest spawning bass (actually some already on the beds), may be in the process of spawning, taking place all during the first to second week of April. As March and April draws to an end, most of Lay lake’s bass will have finished their spawned out rituals for this season. However, the “big bass shallow water explosion” is not over yet! Bass anglers always have some very active post-spawn bass to target, during the entire month of May and often on into the month of June (before things really begin to heat up for the summer), there are still a lot of big, hungry female bass still cruising the lake’s shallows, but this time, in search of an easy–to-catch meal. Lots of smaller male bass will still be around the shallows as well, guarding the beds from egg-eating bream and other pesky intruders and protecting the hundreds of newborn baby bass fry. Until they are but a few inches in length and big enough to get out on their own, in their now, new undiscovered underwater world. All alone on their own to some day grow up and reproduce another year’s offspring, all on their own on Alabama’s Lay lake! 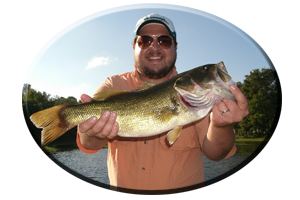 Although bass will actually attack about any lure in your tackle box, the numbers of very productive lures, fished from deep to shallow water, are limited in the month of March. Like most of the year its all according to the weather! If late winter’s trailing cold fronts continue to linger around, the pre spawning process, of both male and female bass suddenly invading the lake’s shallow waters, could be delayed. Also March is a notorious month for displaying lots of rain, often about every few days, creating stained to muddy water conditions at any given time. This can often call for fishing with a much slower presentation (slower than usual) often selecting bigger model lures like big worms, big lizards and gaudy jig combos. Or the exact opposite selecting smaller finesse worms of 4-6 inches, or smaller four legged creature baits, smaller profile beaver-type plastics, crayfish imitations and other weighted lures. Even smaller jigging spoons fished on or near bottom, along spawning routes can be deadly on numbers of bunched up bass. Also deep diving crank baits, both floating model and suspending model hard-bodied jerk baits and especially lipless lures. These lures cover shallow to deep water fast and bass anglers will discover the more active bass, in schools holding along pre spawn routes as they migrate towards the lake’s shallows. 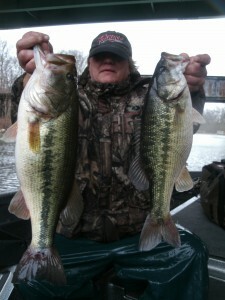 Swim baits and A-rigs are great search baits and often attract the bigger, bass bite! 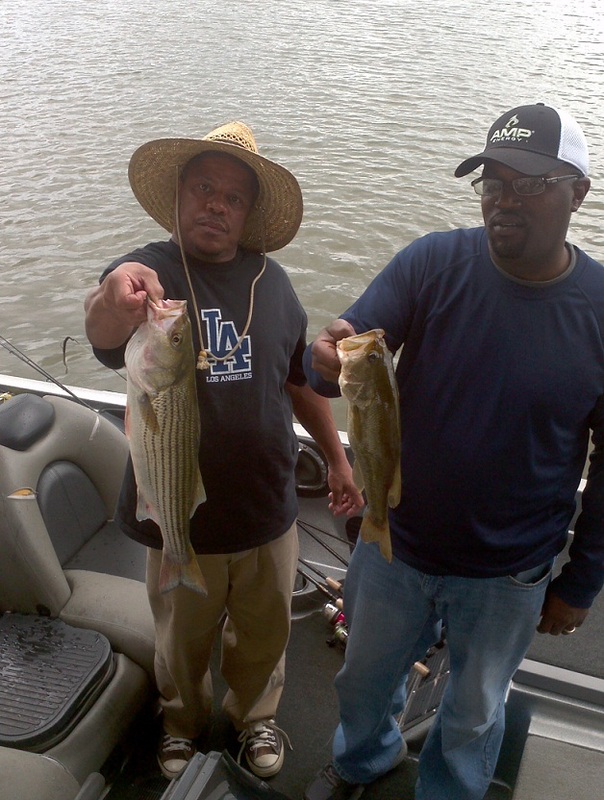 As April arrives hundreds of bass will invade the lake’s weedy shallows, rocky flats and rock bluffs and any type of wood cover found in the shallows such as stumps, standing timber, brush piles and man made piers and boat houses. Calling for a number of lures fished from top to bottom. Topwater lures, especially weed less models will come into play, as bass located in and around the various varieties of aquatic weeds begin to attack your many offerings. Fake frogs, buzz baits, prop baits and poppers are very productive. Lures fished weightless (with only a hook) such as floating worms, soft jerk baits and Senko’s type lures, are all good choices, often for targeting for sluggish bass found along weed edges. Spinnerbaits, chatter baits and swimming a jig combo are popular lures and tactics that can often fool even the weariest of bass all during the spawning season. There are so many lures and techniques for anglers to discover as the lake’s waters warm, too many lures and techniques to list, that will all fool bass located in water temps of 70-80 degrees as the spawning season comes to an end and summer nears. 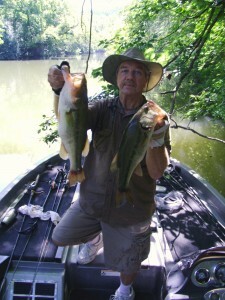 Alabama rigs (multi hook lures), jigging spoons, drop shot rigs, both hard bodied and soft bodied swim baits, Texas-rigged plastics like worms, lizards, crayfish imitations, beaver-type plastics and creature baits, including Carolina-rigged plastics, or soft plastics rigged on a jig head. Both floating model and suspending model, hard bodied jerk baits, shallow to mid diving crank baits and lipless lures again all come back into the bass catching picture! As hungry, post spawn gather up in schools. Just like during prespawn times! Only this time no spawning in mind…just here to eat! 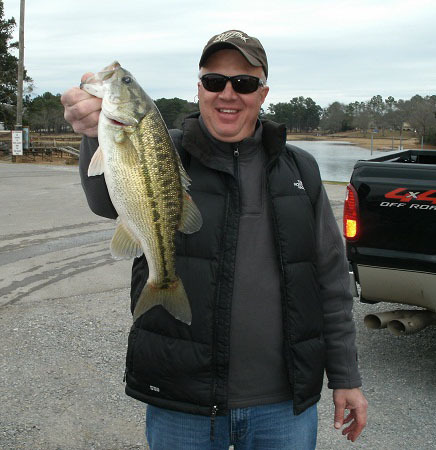 So make plans now to visit Alabama’s Lay lake during this Spring spawning season for some fast shallow water big bass action! Often lasting for the next three months! Or, you can always make plans to call on Reeds Guide Service (205) 663-1504…first! 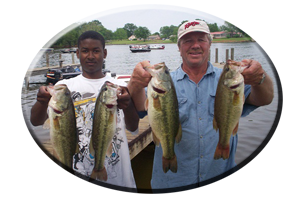 Alabama’s oldest, professional — bass fishing only — guide service, guiding anglers from all over the globe for over 40 years, fishing state wide, year round, in all seasons for all species of bass! Using lures only, no live bait or trolling! Thanks and Good Fishin’ during This Spring Season on all of Alabama’s Lakes! Be safe and courteous to other anglers and always practice catch and release! Reed Montgomery owner of Reeds Guide Service B’ham Al. (205) 663-1504 Website www.fishingalabama.com Like us on face book too!